What a perfect day and setting for an amazing couple! Taryn and Aman's engagement session at Scarborough bluffs was such a great backdrop for capturing their love and excitement as their wedding day quickly approaches. If you don't know the bluffs well, it is a hidden gem that offers panoramic vistas, dense nature and fauna and holds a relatively obscure outdoor collection of ancient Toronto architectural artifacts called Guildwood Park. We started the session up top of the bluffs and tried to capture lots of different perspectives, colours and textures before heading to the park to check out the modern buildings and art. 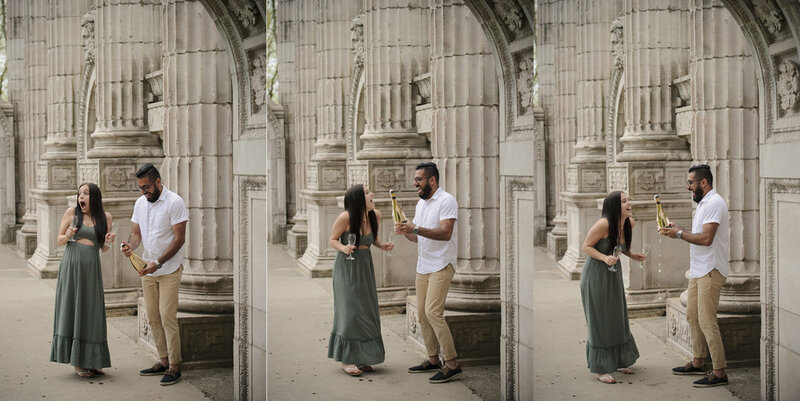 Of course, no engagement session is complete without some bubbly so Taryn and Aman made sure to bring a bottle on our adventure around the grounds. The day and lighting was so stunning that we made a final stop in our favorite neighbourhood, the Beaches, we made sure to hit the beach before saying our good byes. We had such a fun time working with Taryn and Aman and can't wait to be a part of your big day! !